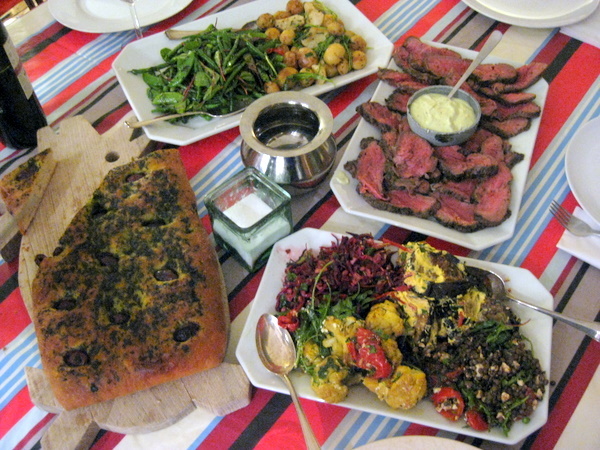 It’s easy to be inspired to cook in the summer, with all the fresh, seasonal produce available from farmers’ markets and backyard gardens. 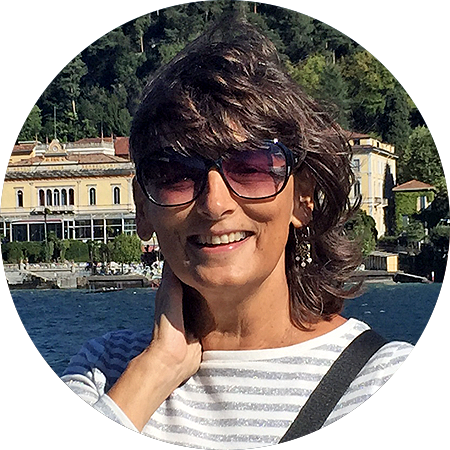 It’s also easy to be inspired when a company like Olio2go sends you some outstanding extra virgin olive oils from Tuscany. This trio arrived in the mail the other day and I knew exactly how to start using them, after harvesting a ripe eggplant from the garden. 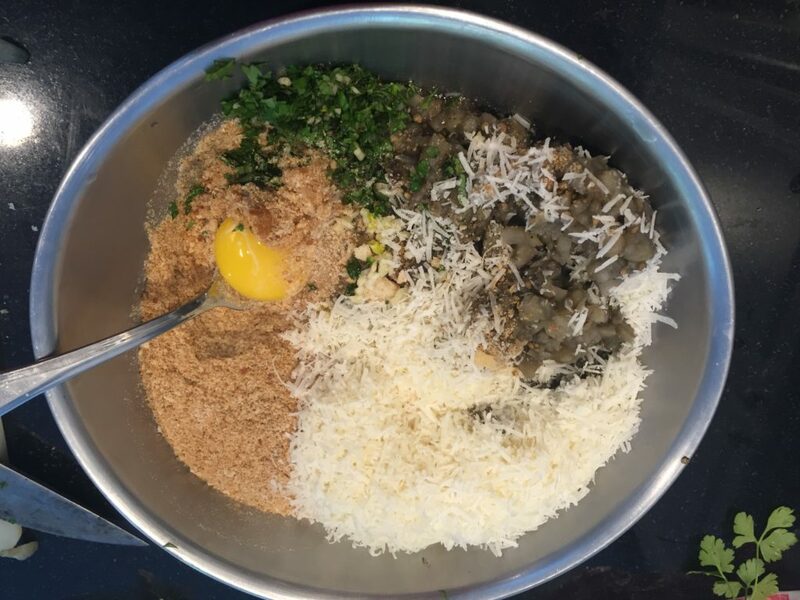 It had been at least a year since I made pasta alla Norma, the iconic Sicilian dish with eggplant, named after Bellini’s opera. It was time once again. You don’t have to peel your eggplant, and I was sorry I had, since the skin was so thin and the purple color would have made a nice contrast to the sauce. 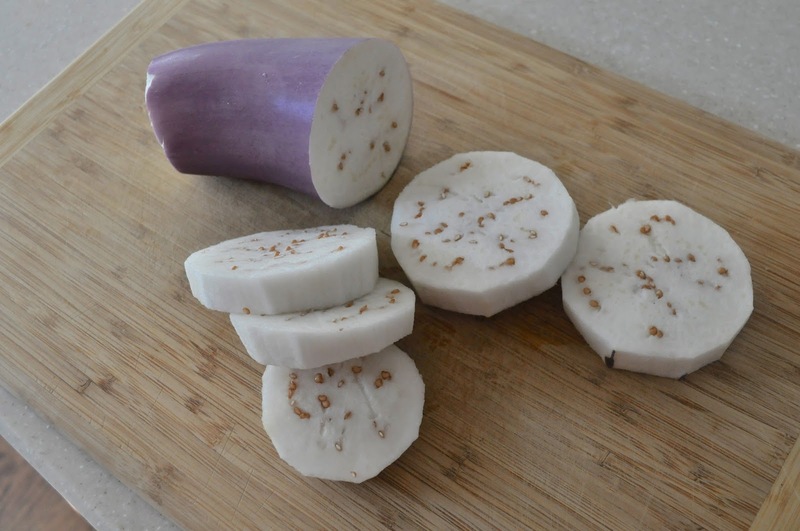 Slice the eggplant (about 1/2 inch thick – any thinner and the pieces will fall apart in cooking), then cut into cubes. I spread the cubes on paper towels and salted them. It’s supposed to help remove the bitterness and some of the water. 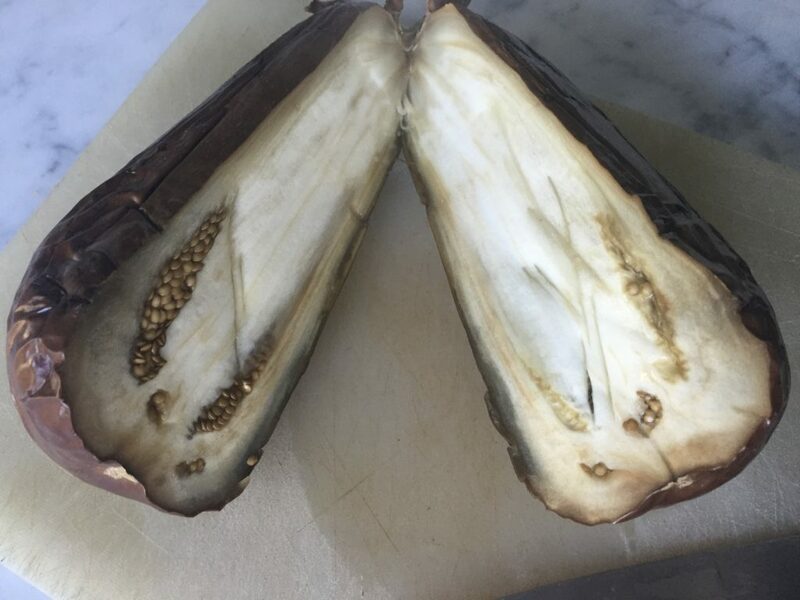 I’m not so sure it’s necessary when the eggplant is so young and fresh, but I do it anyway if I have time. I let the cubes drain on the paper towels for at least 1/2 hour. 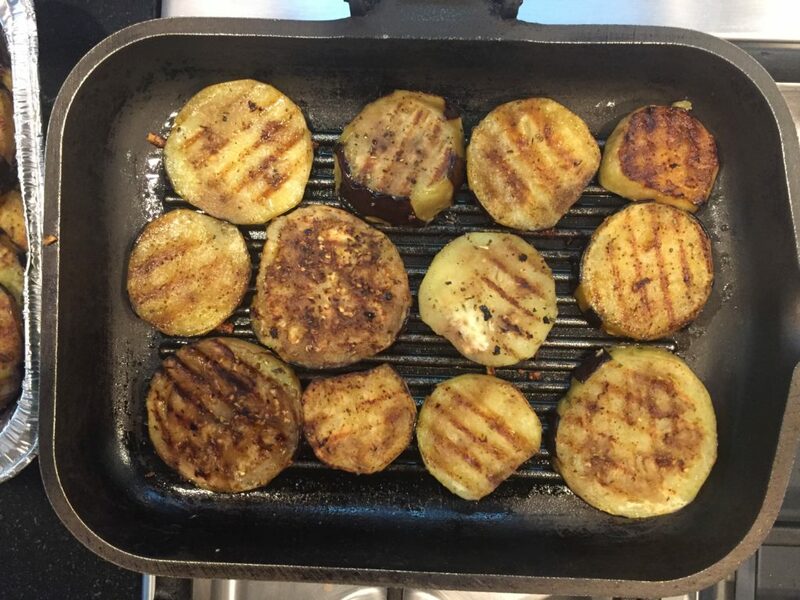 Many people grill or broil the eggplant, rather than fry, since eggplant is notorious for soaking up oil. I’ve done it myself and it works just fine. 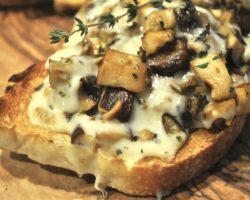 But it’s just not as flavorful as cooking it in oil and if you cook it in a nonstick pan, it minimizes the amount of oil needed. 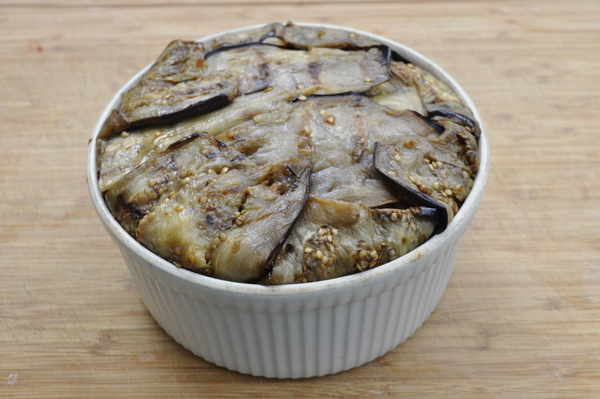 I chose to cook the eggplant using the Guadagnolo Primus extra virgin oil from Olio2go. This is an intensely spicy oil that comes from pressing of the earliest ripening olives. 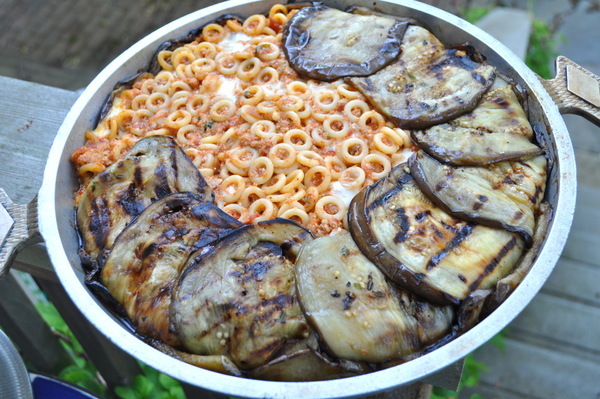 I thought it would hold its own with the tomatoes and eggplant, and it did. 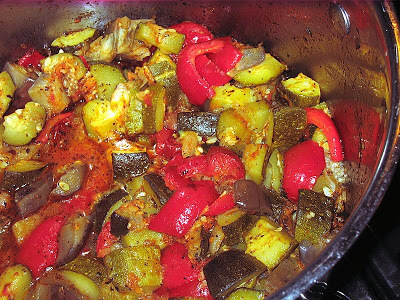 But I didn’t want the eggplant laden with oil, so I limited myself to four tablespoons, enough to grab the flavor of the oil without overly drowning the eggplant. I also added a drizzle at the end to finish the dish. 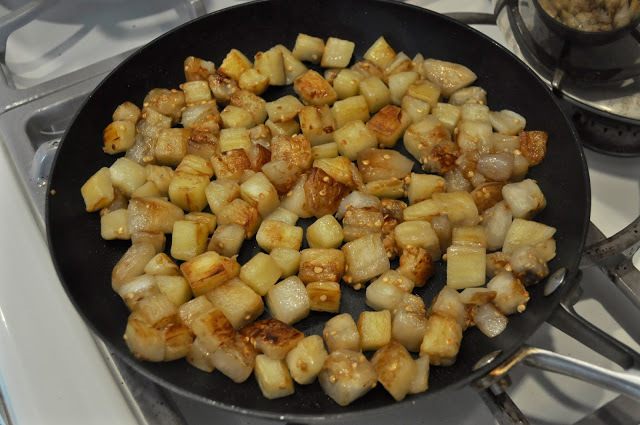 A nonstick pan (I love the ones from ScanPan) is almost essential in keeping the cubes from attaching to the bottom of the pan. 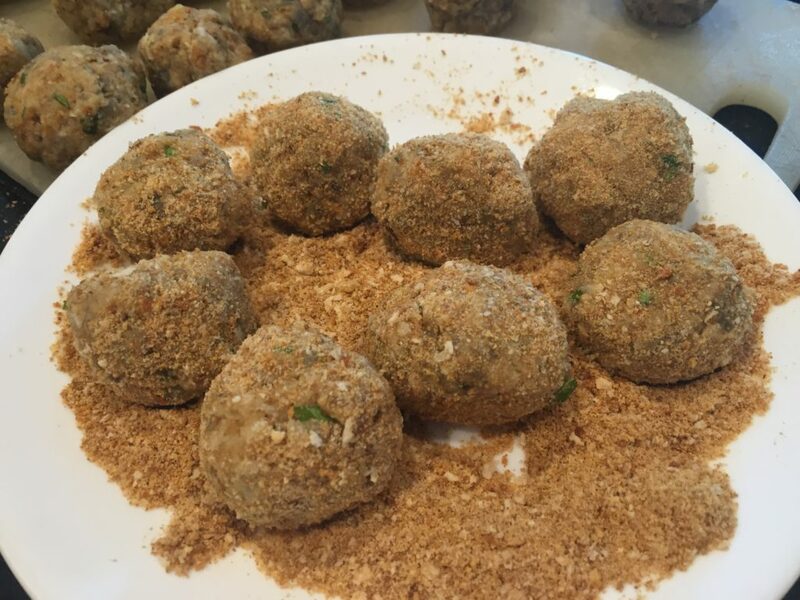 Toss them around until they’re cooked through and golden brown. Meanwhile, prepare the sauce. 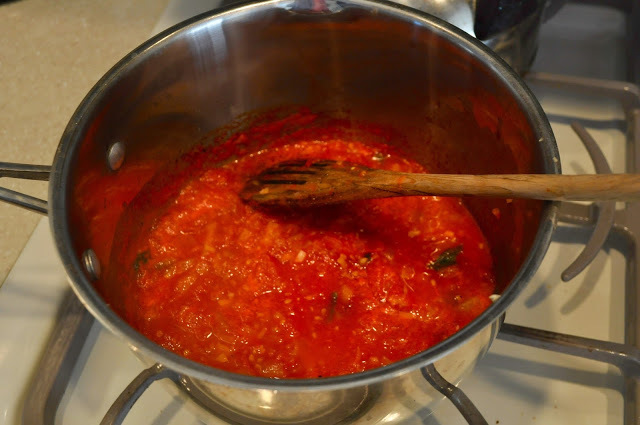 I used fresh tomatoes from the garden, cooking them for only about 1/2 hour, to keep the sauce nice and light. Feel free to use a good canned variety. Gustiamo.com sells fantastic ones, including these Piennolo tomatoes from Mt. Vesuvius. 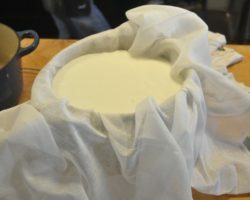 A crucial ingredient to pasta alla Norma is ricotta salata cheese – a dry, salty ricotta cheese that can be found in Italian specialty stores or supermarkets. 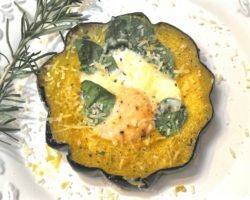 Can you make this dish without it? 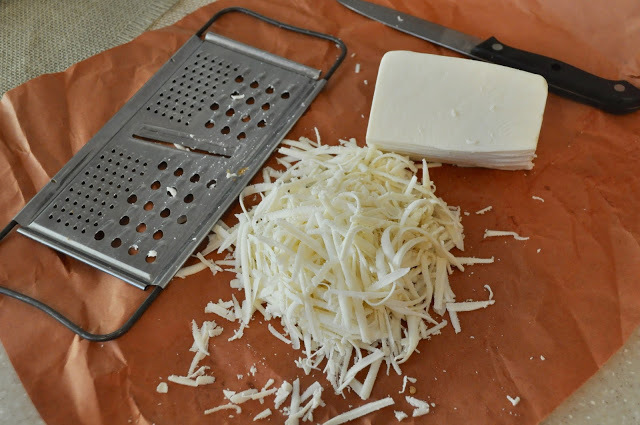 Yes, you can use parmesan or pecorino, but it won’t be the same. 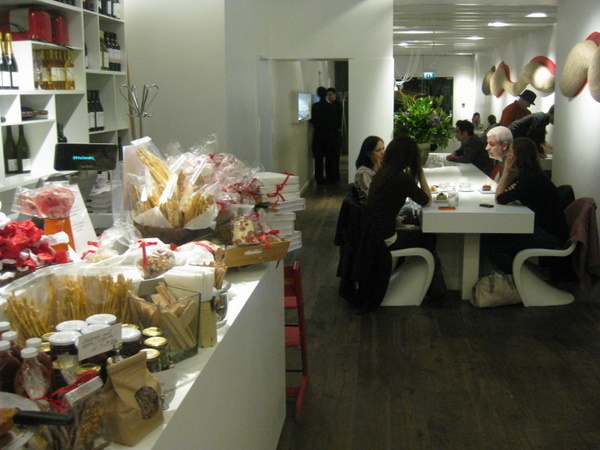 So search out ricotta salata if you can. 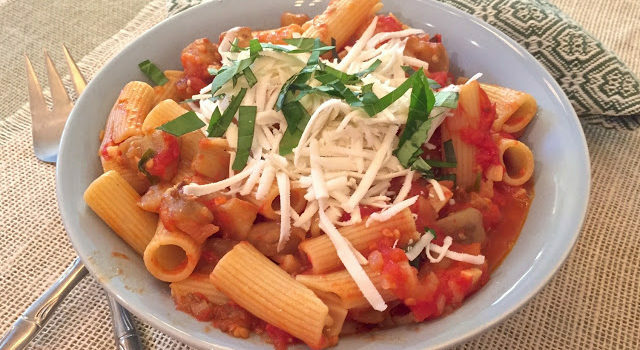 Toss the pasta (traditionally rigatoni) with the sauce and eggplant, top with the ricotta salata, a drizzle of a little more olive oil, and a basil chiffonade. It will make you wish summer could stay all year. 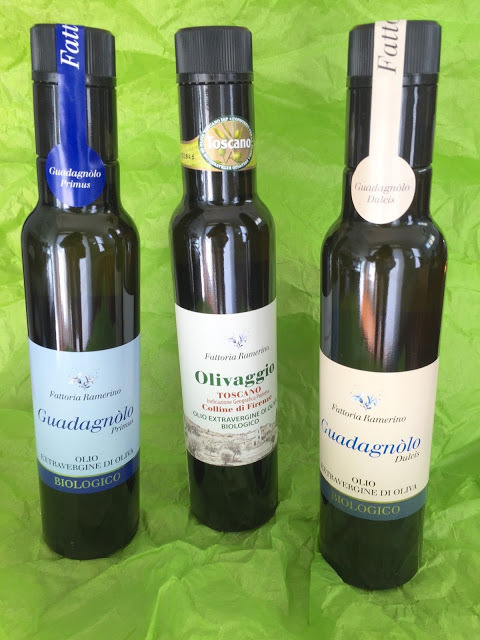 Stay tuned for more recipes using these fantastic olive oils from Fattoria Ramerino. 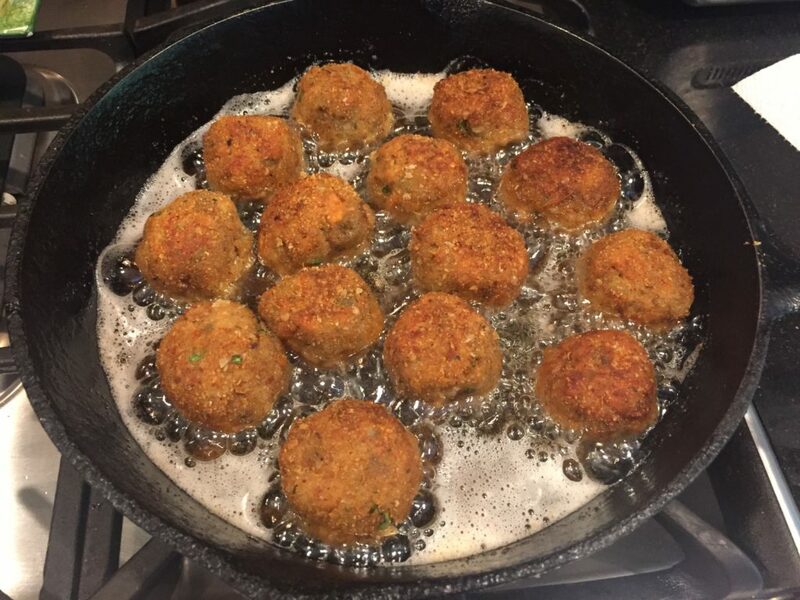 Don’t forget to check out my Instagram page here to see more of what I’m cooking up each day. Peel the eggplant, if desired. Cut into cubes, about 1/2 inch square. Sprinkle with salt and let them drain for a half hour or longer. 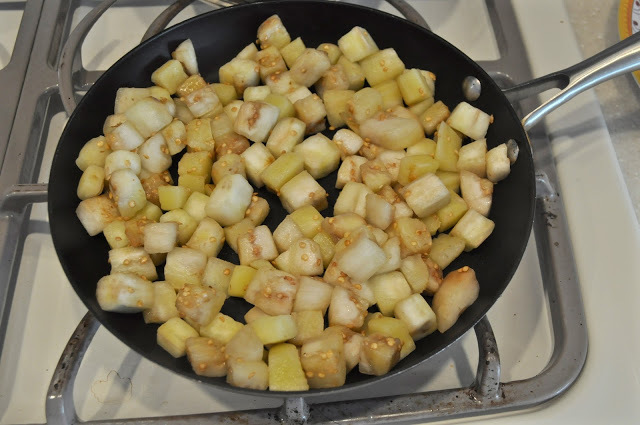 Place the olive oil in a nonstick pan and toss in the olive oil, cooking until softened and lightly browned. 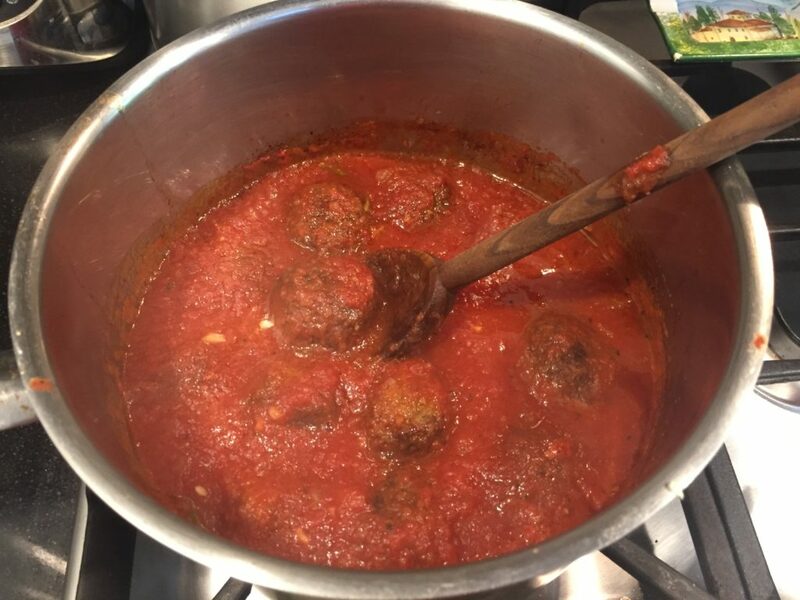 Set aside and make the sauce. For the sauce, peel the tomatoes by placing in boiling water for a minute or two. Slip off the peels, core and dice. Pour the olive oil into a saucepan. Add the onion and garlic, cooking until softened. Add the tomatoes, salt, pepper, crushed red pepper and basil. Cook at low to medium heat for about 1/2 hour to 45 minutes. 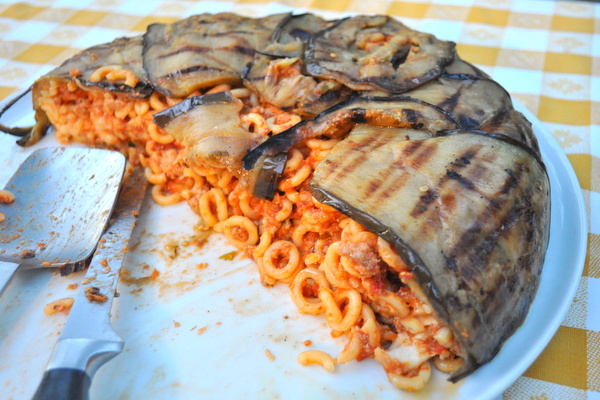 Cook the pasta, drain into the tomato sauce, and add the eggplant. 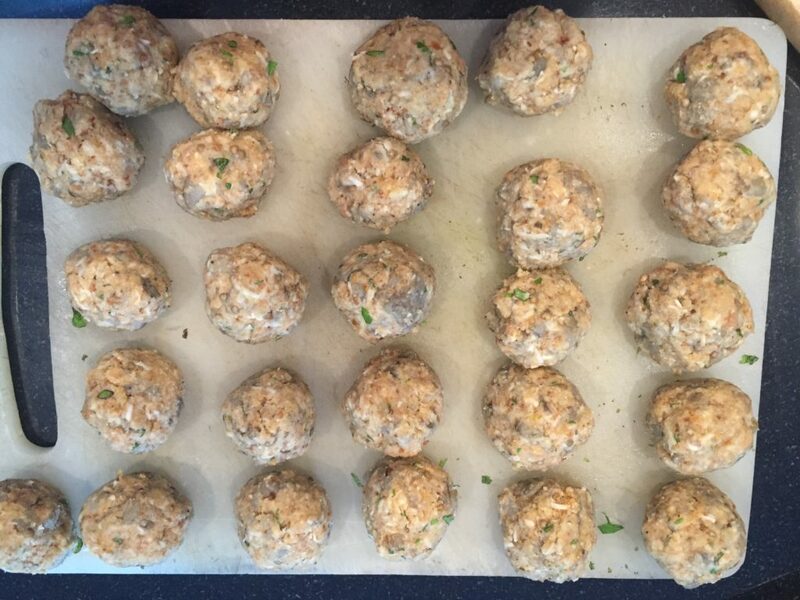 Toss all together, then top with the ricotta salt, more minced basil and a drizzle of olive oil. 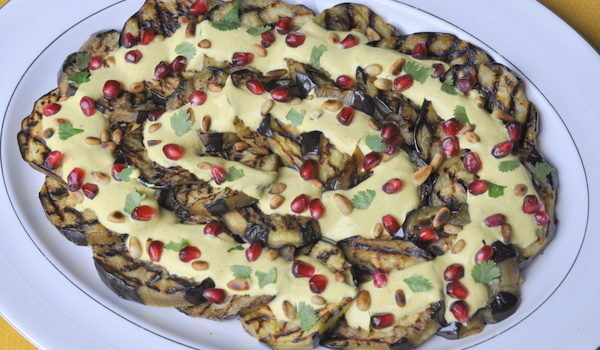 Looking for a way to use up some of that late summer eggplant in a show-stopping presentation? 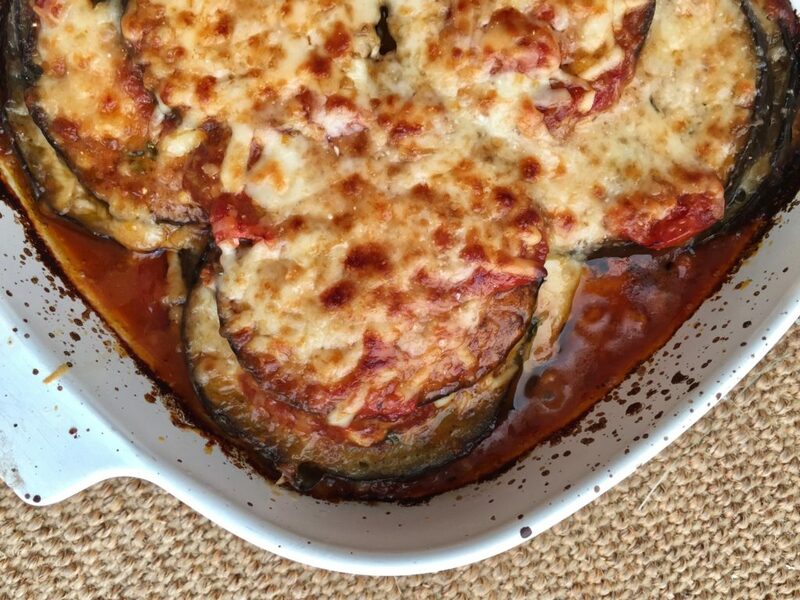 This eggplant timballo fits the bill, and it’s much easier to make that you’d think. Imagine the surprise on your guests’ faces when you slice into this, unveiling the pasta interior. 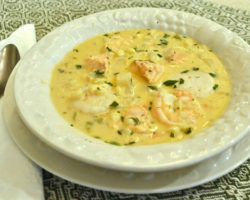 Some of my blogger friends – Rowena and Marie – have also posted similar recipes and I always find inspiration from them. For this timballo, I used a one-quart souffle dish that was lightly oiled. 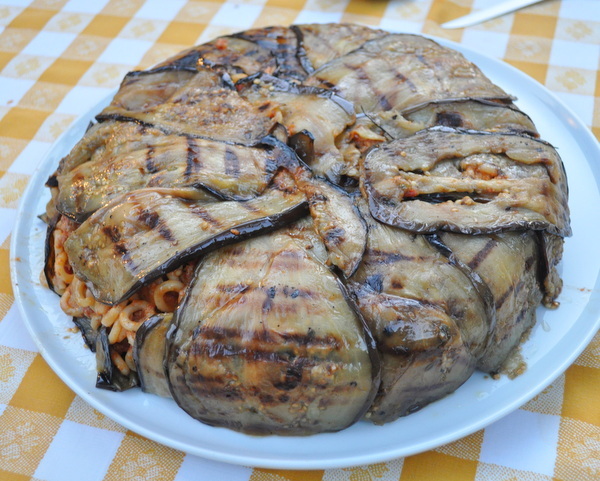 I grilled just one large eggplant, spreading a little olive oil on each slice before placing on the grill. 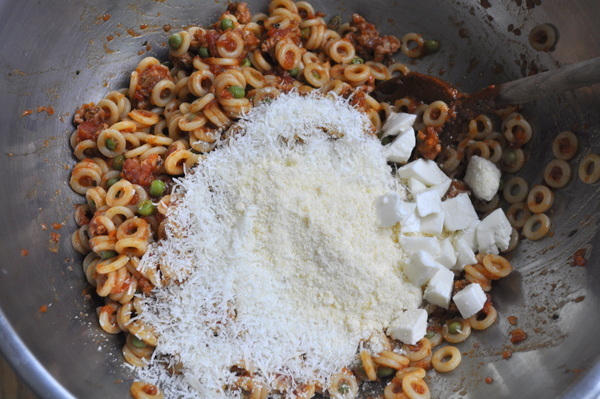 Place the pieces with the prettiest grill marks facing the dish, not on the inside since it will be filled with pasta. 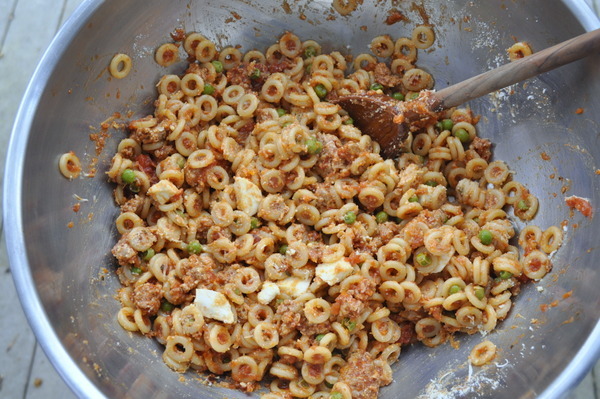 I cooked the pasta – anelli (little rings) in this case – then added some cooked sausage, peas and tomato sauce. 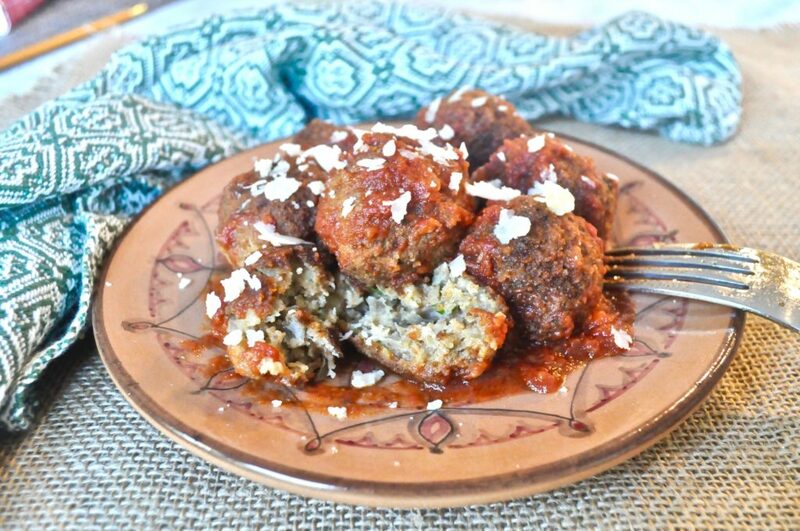 Throw in some parmesan cheese and mozzarella cheese. 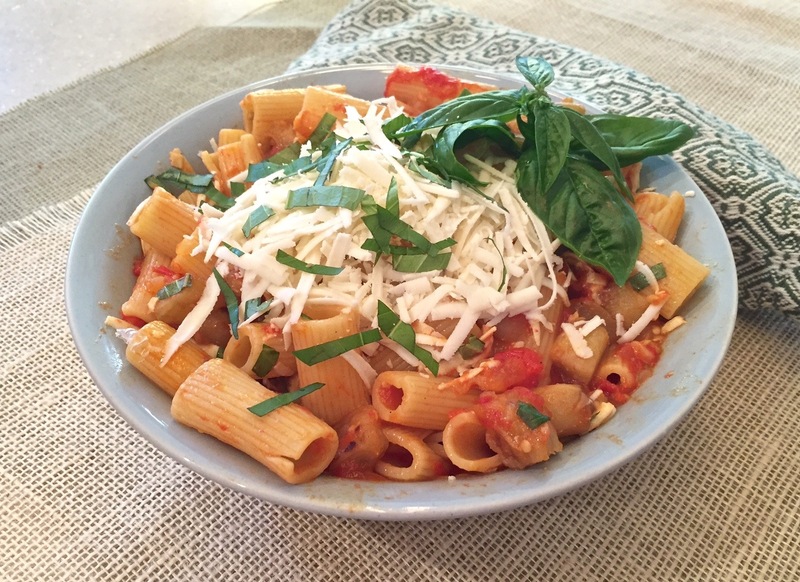 I had only about 2 ounces of mozzarella in the fridge, but I recommend using more. It helps to “glue” everything together. And stuff the dish to the brim. 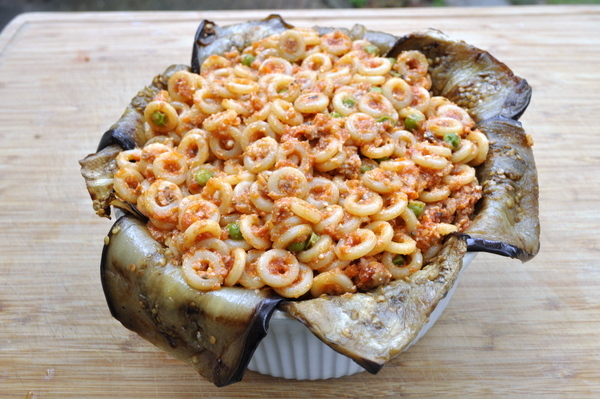 Fold the eggplant slices over the pasta and bake. 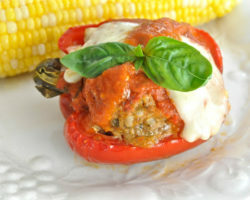 Let it rest at least 15 minutes before flipping and serving – with extra sauce on the side. 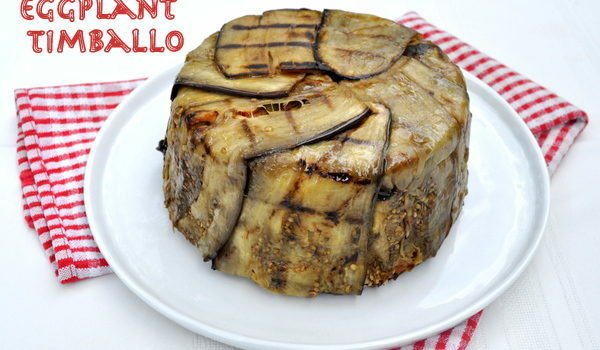 Here’s a timballo I made last year using a much larger pot. 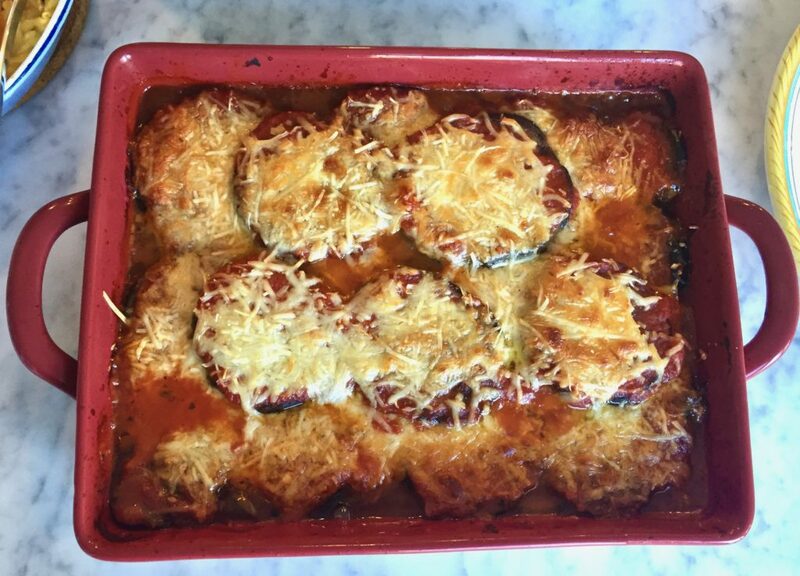 You can see I ran out of eggplants, even though I used three. 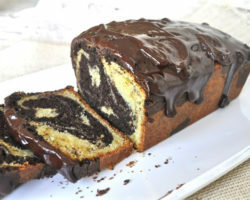 I baked it this way anyway. It held together well enough and everyone loved it just the same. 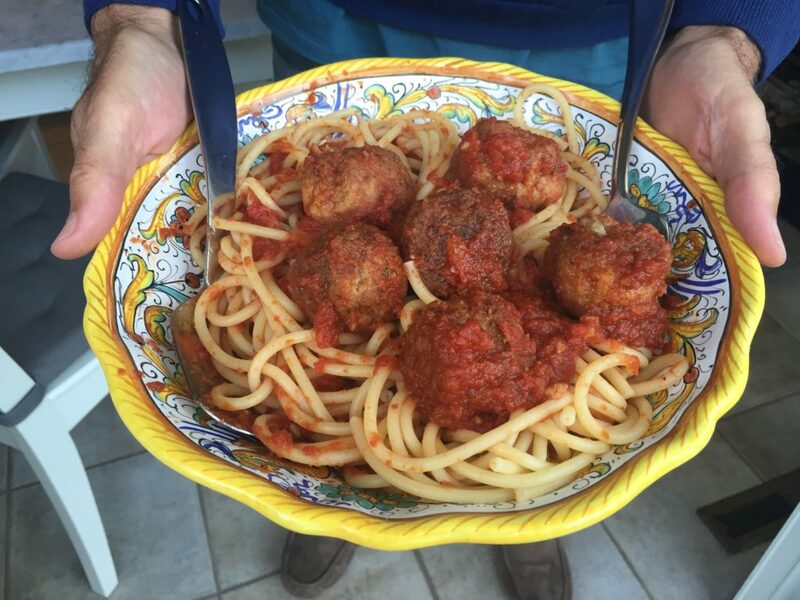 Even though it uses only one pound of pasta, it served a lot of people. That’s why I went with the smaller one-quart container you see in the first photo this time, that used only 1/2 pound of pasta. 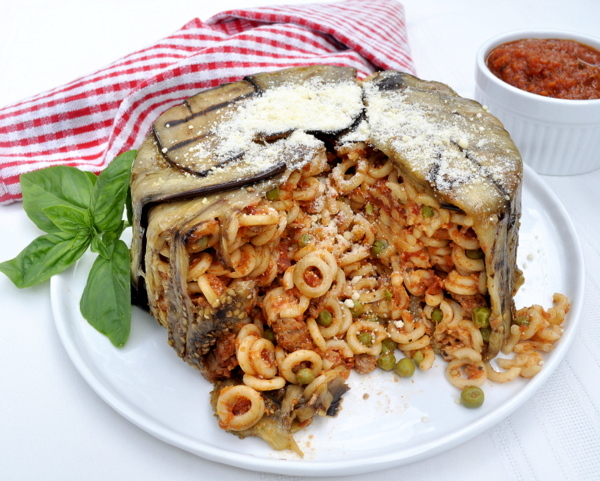 But if you’ve got a crowd of a dozen people coming, the larger timballo will serve that many people comfortably. 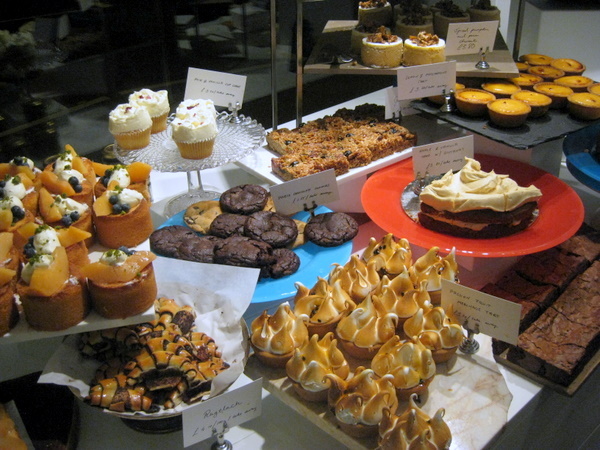 This will serve at least six people easily. 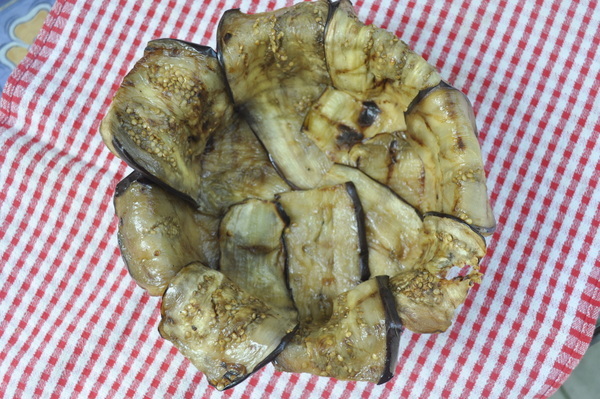 Smear the eggplant slices with oil and grill until cooked through. 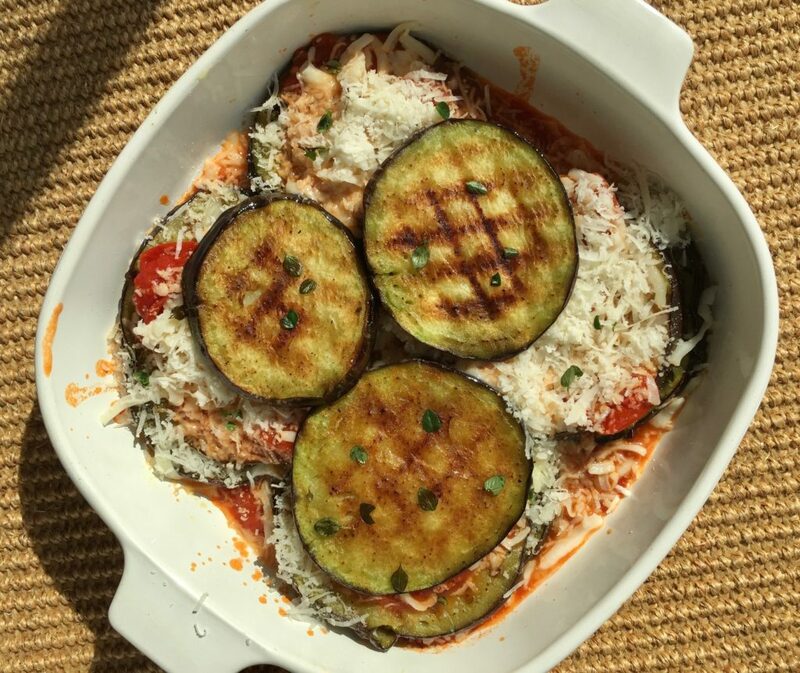 Oil a one-quart souffle dish or similar vessel and arrange the cooked eggplant slices inside, leaving enough hanging over the side to fold over the pasta when the dish is full. Remove the casing from the sausage, break into bits and cook in a pan. Boil water and cook the pasta until it’s al dente. 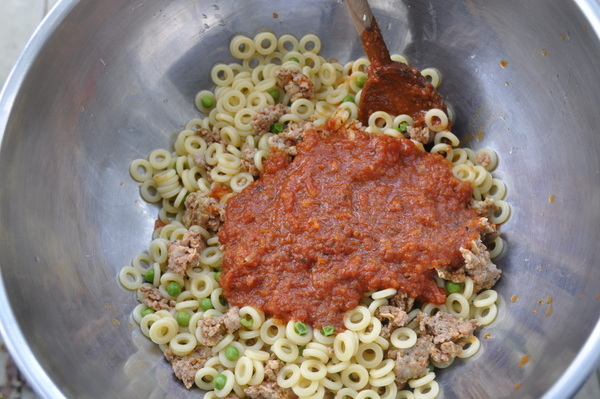 Drain the pasta and place into a bowl with the cooked sausage, and the rest of the ingredients, using as much tomato sauce as necessary to coat well. Reserve some of the sauce for later. 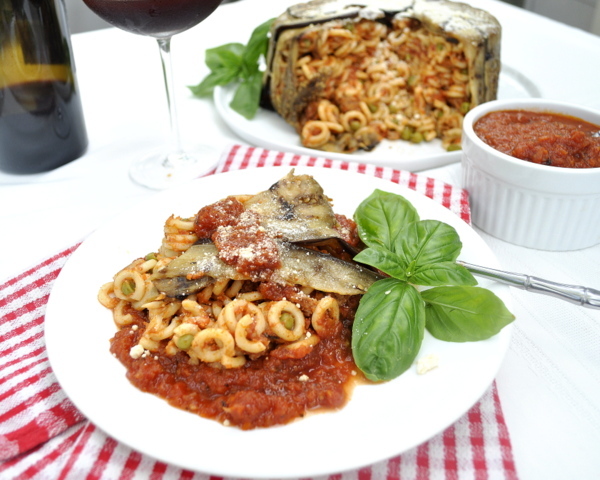 Fill the dish with the pasta, then fold the eggplant slices over, covering the top of the pasta completely. 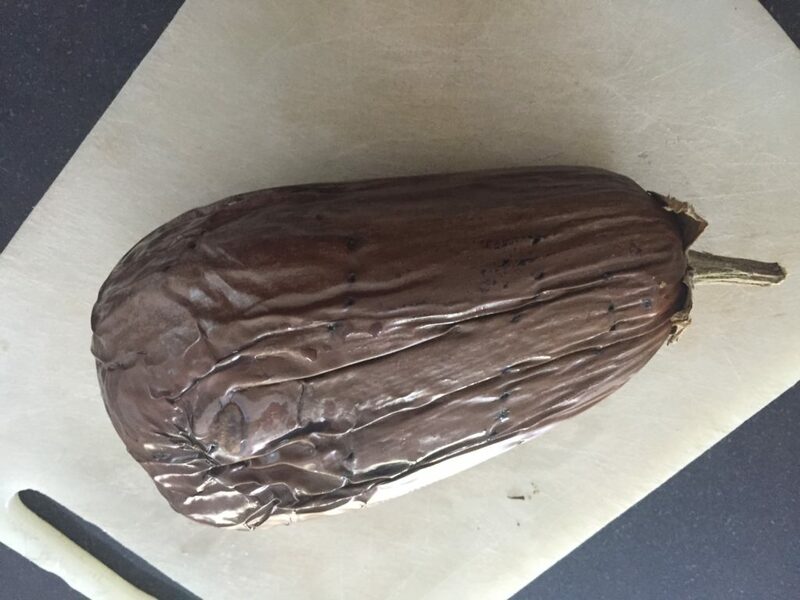 Cover with aluminum foil and bake in a 350 degree oven for 45 minutes. Remove and let it rest for at least 15 minutes. 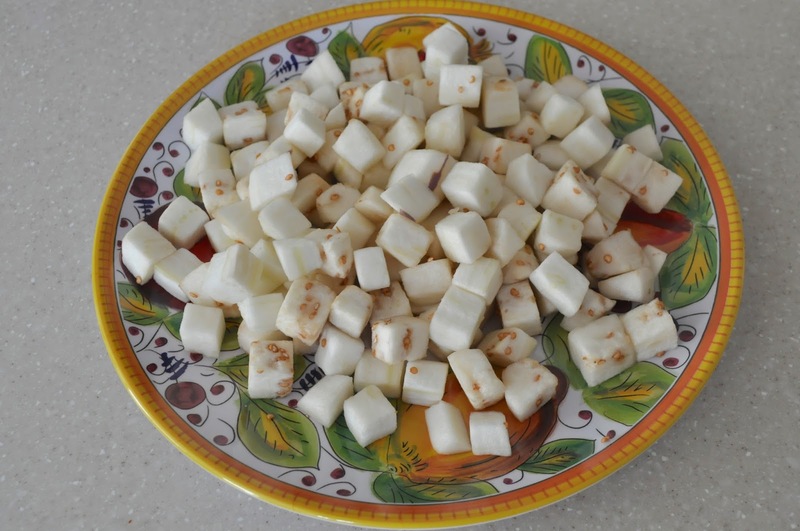 Invert onto a serving platter, sprinkle with some parmesan cheese, and serve with the extra sauce.